When you have a courtyard or atrium, you can create your own private paradise! No other design method can give you this level of seclusion and security. Courtyards and atriums are outdoor spaces that are completely or partially enclosed by a building or wall. Most are unroofed, but some are covered with some clear material like glass or plastic that allows light in. 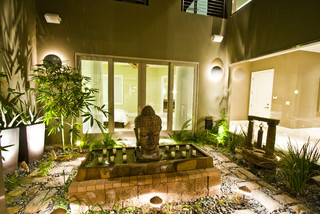 A courtyard offers the ideal space for a hot tub, outdoor dining set, meditation bench, and/or fountain. A fountain is particularly attractive because the relaxing sounds of the falling water can be heard throughout the house. I’ve seen beautifully landscaped courtyards with small ponds and lavish tropical or desert vegetation. 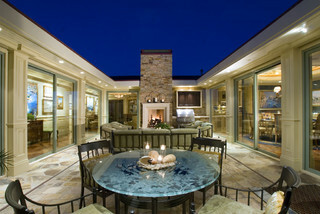 Since courtyards are often visible from many places inside, they can greatly enhance the ambiance of the home. A courtyard not only adds more living space, but it also adds a feeling of more spaciousness inside the house. It’s kind of like how high ceilings and open floor plans give you a sense of having an abundance of space. There’s another advantage to courtyards that can reduce your energy bills. Ventilation! Since there are more windows and the ability to have cross ventilation, it’s easier keep your house cool – and fresh. With good ventilation, the likelihood of mold, fungus, and bacterial growth is reduced. 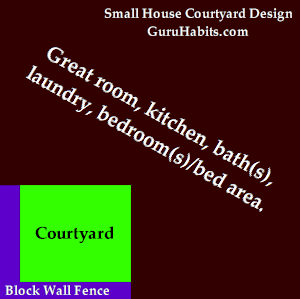 You might be wondering how a courtyard could be designed into a small house. I’ve seen it done two ways. 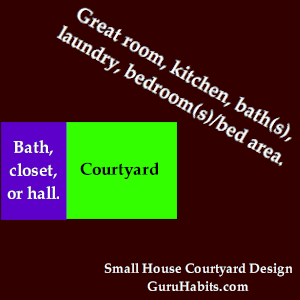 One or more small spaces like a closet, bathroom, or hall enclose the courtyard on one side and the rest of the house surrounds it on the other three sides. See Diagram A below. The house is built in an L-shape with an opposing L-shaped block wall fence to enclose it. See Diagram B below.